Wilson as a man of the people? Hardly. He was a brilliant academic who never seemed to have left the ivory tower. Nevertheless, he is one of my favorite presidents and I'm currently doing some reading about him. 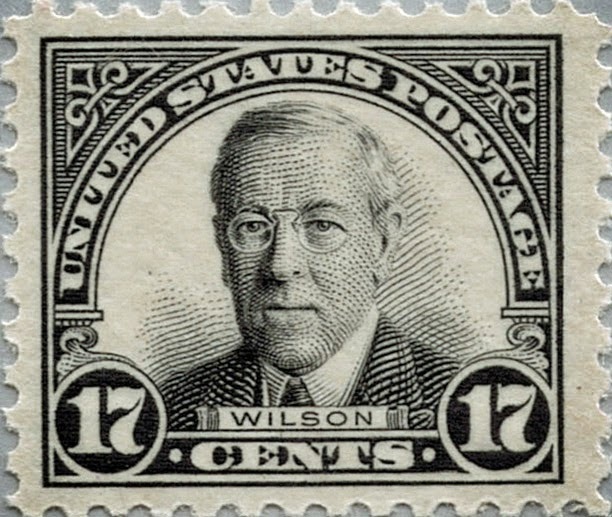 Wilson provided strong leadership at a critical time. Were mistakes made? Definitely. But the overall course was kept. He is pictured on a few US stamps of which the Scott 623 at left is by far my favorite. It is simple and bold, the creation of of Claire Aubrey Huston who also designed the Panama Pacific series. As a pince-nez wearer myself, I am impressed with Huston's accurate depiction of Wilson's hoop spring pince-nez. 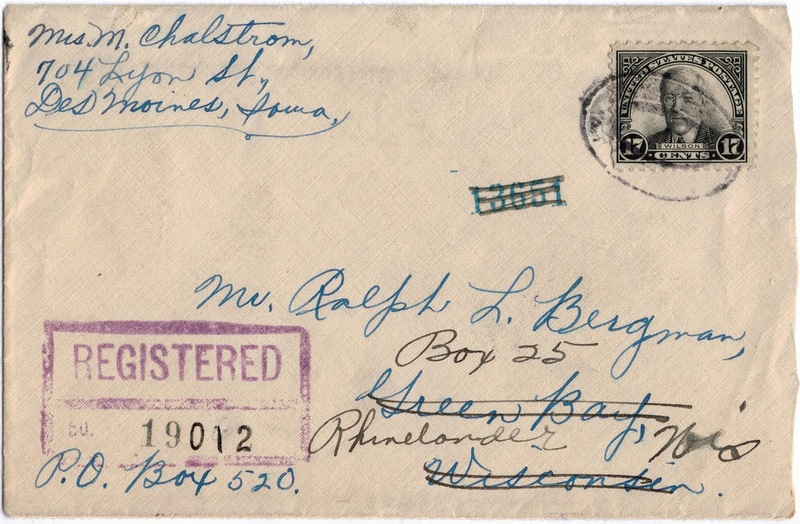 I recently acquired a nice registered cover showing the 623 stamp in single usage. Why do I call Wilson a man of the people? Because underneath the aloof academic persona was a man with very human emotion. I've been reading Woodrow Wilson by H.W. Brands and I found a truly touching section. 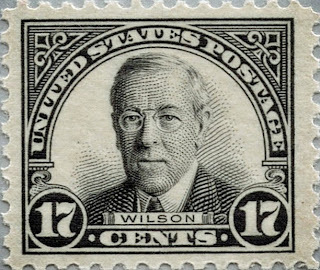 Wilson's wife died and in 1914 and he was completely distraught and depressed. It was very sad. Then "What finally snapped him out of it [depression] was not any insight into the meaning of life and death but an attractive face and a pretty figure." (Brands, p. 65) The face and figure belonged to Edith Bolling Galt, the second Mrs. Wilson. Yes, President Wilson was quite human. I highly recommend a website of unique interest: the Medical History of American Presidents. The one on Wilson is very interesting and sheds insight into his actions. 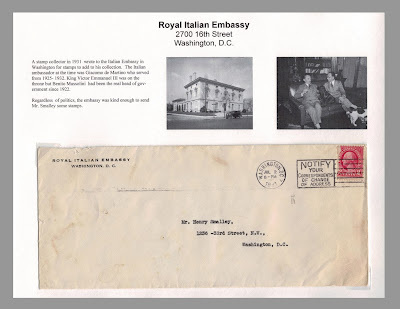 One of my favorite recent purchases has been a cover and letter from the Italian Royal Embassy (1931) to a stamp collector in Washington, D.C. The letter is from a counselor in the embassy and he acknowledges the request by the collector for some of Italy's stamps. These items are from a very interesting and troubled time in history. In 1931 Mussolini had dictatorial control of the Italian government and was about to embark on a conquest of Ethiopia a few years later. I've been creating personal display pages for many items in my collection. One of my best sources for images is the online Library of Congress website. They have an incredible collection of high resolution images that can be downloaded for free. In my page above, I found a photo of the Italian Embassy in Washington circa 1930. Also there was a great interior photo showing high level Italian officials with their pet dogs circa 1935. 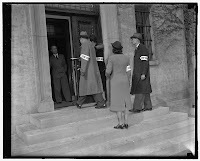 The embassy was the site of many protests by American groups against the Italian government in the late 1930s. 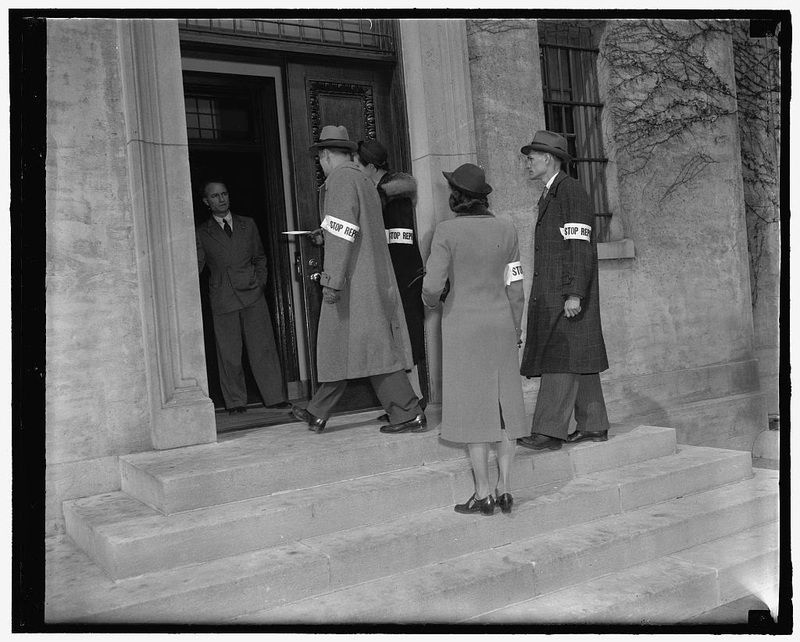 In the photo at left, members of the American League for Peace and Democracy present a protest letter to an official at the embassy (4/7/39). Several blocks away the group had picket lines protesting fascist conquests. 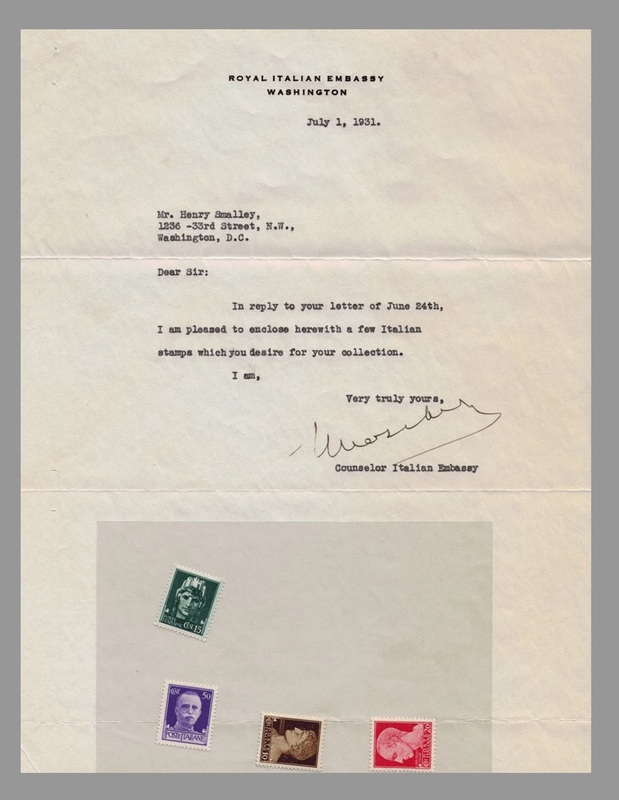 In earlier times there were some light hearted moments at the embassy. 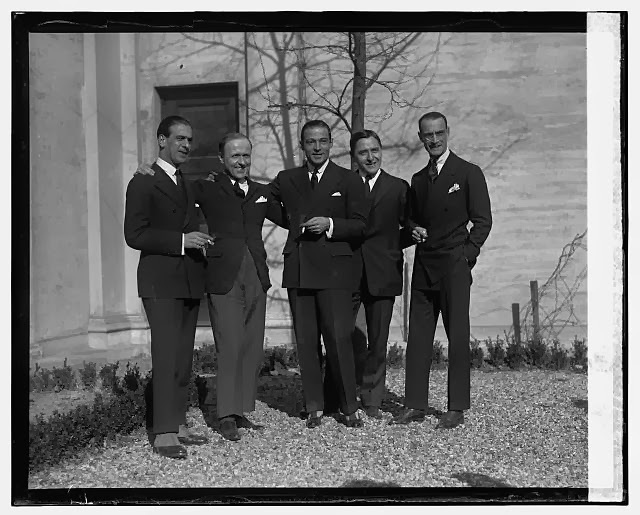 Back in 1926 film star Rudolf Valentino posed with embassy officials for photos (1/29/26). Sadly, Valentino died within the year at age thirty-one. One can appreciate historical items much better when knowing the context of the times. 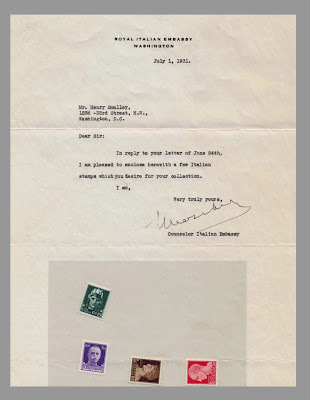 Note: The stamps shown above are not original to the cover and letter but added for display purposes.